This top down shooter places sees you in the roll of an Agent in a secret agency that deals with supernatural investigations and the rescue of lost souls. 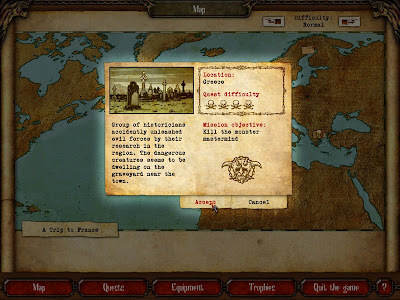 Starting in Europe your faced with a mission that puts you on the trail of treasure thieves, and in search of the arcane items they have liberated from an ancient hiding place. Follow the trail while completing a variety of missions and finding clues, trophies and weapon upgrades. Fight spiders, skeletons, zombies and enemies that can only be compared to, Left 4 Dead’s, Boomers. Each of your weapons will have a different effect on your enemies and the many destructible items found on the map. As you progress remember to pickup items, weapons and character upgrades – these will be come more important as you progress through the harder levels. Easy manipulation of your character with the directional arrows while your attack options are managed by your mouse hand. Use of the scroll wheel makes weapon selection a breeze, moving in a downward motion as your firepower increases; from a sword to duel wielding pistols and and ultimately an automatic machine gun. Supplement your weapons with sticks of TNT and character upgrades like; speed, and armour. ** Originally this was to be a full review but due to technical difficulty our reviewer was unable to complete his article, once he is able we will post his full review.